Bewitching people’s hearts and minds for centuries, this stunning crystal suggests someone could try to take advantage of your giving nature this week. Selfish behaviour from friends and family members may leave you feeling very used, and you may need to watch what you say to a very two-faced person around you too. Prevent their bad vibes and negativity from draining your energy by placing an Onyx by your front door, or keeping one in your home or work place. With a rich and magical history, this spellbinding crystal is thought to help with everything - from calming your mind and boosting your fertility, to healing your pain and protecting your family. Known as a stone of love, healing and family, it suggests there could be some tension between you and a female friend or family member this week. Heal the bond between you - and dissolve any tension between you - by holding a Pearl by your heart. Thought to be one of the oldest crystals in the world, this mesmerising crystal has enchanted people’s hearts for centuries, and is often associated with love and healing. Synonymous with protection, it suggests you may find yourself feeling slightly drained by a friend or family member’s needy behaviour this week. Tearful outbursts from friends and loved ones may leave you feeling very frustrated, and someone’s constant whining could really test your patience too! Known as a stone of protection and healing, this stunning crystal suggests you may need to distance yourself from a very one-sided friendship this week. Ungrateful behaviour from friends, colleagues and loved ones may leave you feeling slightly resentful, and you may find yourself slipping into an old - and toxic - habit too. Protect yourself from any bad vibes and negativity - and fill your heart with peace and positivity - by keeping an Amethyst in your home or work place. 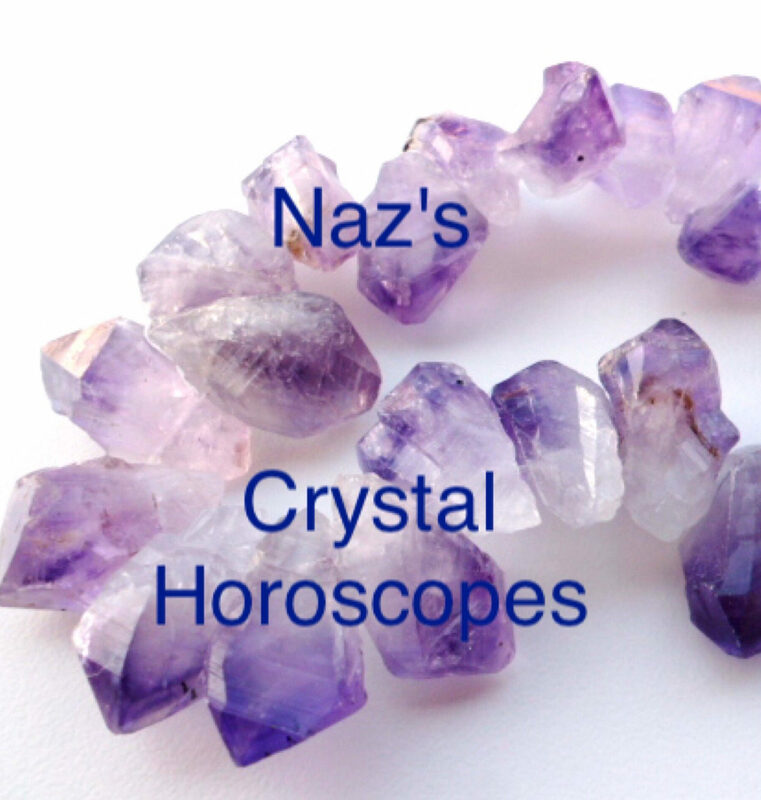 Synonymous with love and healing, this beautiful crystal has bewitched people’s hearts for centuries, and is thought to be one of Kate Hudson’s favourite crystals. Known as the stone of unconditional love, it suggests a friend, colleague or loved one could surprise you with their kindness this week. Heartwarming messages from friends and family members may leave you feeling slightly emotional, and someone you love and trust could surprise you with a very thoughtful gesture too. Symbolising strength, this stunning crystal was highly prized by ancient warriors - who believed the gem would help them defeat their enemies in battle! Thought to gently wash away our fears and anxieties, it suggests you may find yourself feeling slightly down about your appearance this week. Thoughtless comments from partners and family members may leave you feeling very emotional, and there could be a heated exchange between you and a friend or loved one too. Synonymous with the sea, water and travel, this captivating crystal suggests there could be an exciting opportunity for you to travel abroad this week. Amazing opportunities at work - and unexpected invitations from friends and loved ones overseas - may leave you feeling very excited, and the bond between you and a friend or love interest could become much stronger too. Celebrate all the love and happiness around you by keeping an Aquamarine in your bedroom. Known as a stone of luck and good fortune, this stunning crystal suggests you may find yourself feeling luckier than a four leaf clover this week! Promotions, bonuses and amazing work opportunities can all be expected, and you could find yourself making some new - and truly wonderful - friends too! Maximise your luck, happiness and good fortune by placing an Aventurine in your home or work place, or simply keeping one in your left pocket. Symbolising love and healing, this stunning crystal suggests you could see a different side to someone around you this week. Cold or distant behaviour from friends, colleagues and family members may leave you feeling very unsettled, and you may find yourself feeling a little lonely too. Calm your heart and mind - and cast your worries aside - by holding a Moonstone by your heart, or placing one beside a photo of yourself as a child. Known as a stone of forgiveness, this captivating crystal suggests you may need to walk away from a very toxic person this week. Hurtful words from friends, colleagues and partners may leave you feeling very tearful, and you may need to give someone a piece of your mind too! Prevent their bad vibes and negative energy from leaving you teary by keeping a Rhodonite in your home or work place, or holding one by your heart.